Among all that's being said about Michael Jackson, he's perhaps most mourned as a performer who entertained and connected with huge audiences worldwide. Beneath the talent, however, you'd find close attention to standard work. Every second of every performance was timed and practiced to perfection by every member of the show, on and offstage. That would be true of Madonna or the Beatles, maybe even Taylor Swift or the Jonas Brothers. Of course, standard work in music is nothing new--notation has standardized music for centuries. And how do you get to Carnegie Hall? Practice, practice, practice. Standard work will fail if there is not enough practice. Time has to be set aside for people to get the timing right, synchronizing to takt time. If possible, experimental space and mockups allow for offline practice. Practice before performance allows a person to fail without negative consequences, and to try again and again until it's right. Observation and coaching helps to get motion efficient and safe from fatigue, strain, or other injury. When muscle memory can take over in performance of their role in the show, workers are free to think about the process and how to improve it with another round of offline experimentation and practice. So add some imaginary song and dance to your day--maybe it's another way to look at the work your team is performing on your stage. For years I’ve heard about the “lean dentist” in Jacksonville, FL, and it’s great to see that he’s written a book. “Learner” is a keyword, without a doubt. 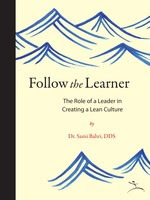 Dr. Bahri tells the story of his thinking about management and leadership and how it evolved under the influence of some landmark books. He openly and charmingly talks about his mistakes and realizations. Because we’ve all spent time at the dentist’s office, usually waiting, it’s refreshing to see a focus on the patient. Our dental experiences make Dr. Bahri’s explanation of lean ideas and their implementation very easy to understand and think about. There are no complicated diagrams or overly detailed explanations, just simple explanations of gaining trust and engagement, reorganizing processes, and continuous improvement. Thanks go to the Lean Enterprise Institute (LEI) for giving us this book. It’s short, easy to read, and I highly recommend it. On a hot day, a book about the icy Himalayas is perfect. Mortenson starts out lost on K2, about to freeze to death, when he is rescued by Mouzafer Ali, his porter, who had searched for him for days. Mouzafer led Mortenson to Korphe, where the village head man, Haji Ali, made room for him in his own home. Haji Ali and his wife nursed him back to health, which took quite some time. Korphe is in Baltistan, in Northern Pakistan, almost impossible to reach and almost completely neglected by the government. The experience was humbling, and the immersion in village life affected him deeply. Most of all, he allowed himself to learn from Haji Ali how to be a leader, how to earn trust. In gratitude, when he was ready to leave, Mortenson asked Haji Ali what his greatest wish for his village was. He said he wished for a school, so the children could learn—even the girls. Mortenson made a promise to build one. The book goes on to describe how Mortenson worked to raise the money needed, how difficult it was to change from being a mountaineer and ER nurse to a professional fundraiser. Eventually he succeeds in raising the $12,000 he needs to build the school, and returns to Pakistan. You can read “Three Cups of Tea” as an adventure story. It moves quickly and is vividly descriptive. Mortenson moves back and forth from California and Utah to Baltistan and other remote places, building schools—55 of them between 1993 and 2003, not as a great benefactor, but as a part of a community dedicated to providing education for their children. Because Mortenson respected the villagers he helped, worked alongside them in constructing the schools, always gained the permission and support of village elders before starting a project, the schools were theirs, for all their children. You can also read “Three Cups of Tea” as a lesson in trust. Going into any organization to make change, no matter how beneficial, only works if people make it theirs. A leader can learn what the equivalent of three cups of tea is in the formal and informal organization of the place he or she hopes to change. “My career has been helped tremendously by the Lean experts that frequent the NWLEAN forum. When questions come up, there are usually answers from the best in the business. How cool is that?” That’s what Dean Bliss of the Iowa Health System had to say about one of the leading lean knowledge exchanges on the web. While there are many good discussion sites, NWLEAN is the one I use most. To find out more about the network, I spoke to director of operations, Bill Kluck. He said, “Back in 1997 the Internet was quite a different place. There was a group at the University of Kentucky that had an email list called the KLMN, the Kentucky Lean Manufacturing Network. It was essentially one way—they would just blast out announcements about courses and upcoming events to the list. NWLEAN has grown to a community of 11,000 members, with more than 6,000 registered as members of the NWLEAN Yahoo discussion group. At it has developed over the years, it has changed with the lean community itself. Kluck said, “I think that the quality of the questions as well as the quality of the answers has been improving over the last several years. The first two or three years people would say, ‘I was just promoted to the lean manager of the organization. I have two questions: what is lean and what do I do first?’ The wonderful thing is that people were comfortable enough with the group to even ask those questions. “For the last several years we’ve gotten into more discussions about the depth of a lean transformation and the requirements for participation at all levels in the organization. We also have discussions about how to implement a particular tool and how it works in a particular situation. What do people get out of a group like NWLEAN? Benefits people mention most are knowledge, recognition, and relationships. Though Bill Kluck says he and the other moderators of the network try to keep the members free from contacts by consultants or others trying to sell them something, people do connect with each other by e-mail, phone, or meeting at events. Thelen has taken his involvement in the forum to a new level. After he formed a network of people in local businesses in his home of Aberdeen, SD, he connected it with NWLEAN in some creative ways. Thelen has also developed national and international relationships with experts who post on the online forum, bringing them to his network in South Dakota, a part of the country that they probably wouldn’t get to otherwise, via videoconferencing. It’s. “I share NWLEAN with people, and other prominent sites or pieces of information that I find. Several people from the forum have gone to Mark Graban’s Lean Blog. I’ve got several people from the medical field in the local network and Mark does a lot with lean healthcare. “There’s so much out there, how do you find the credible sources? The biggest way that people discover lean is through books, and many authors have a blogs or websites. So read a lean book and then look for the author online. These people are well-versed and they tend to know others who are of like mind and who have information and resources. From that author’s website, you’ll find other credible sources. Almost all of them share links back and forth. So once you find one, you’re going to find a bunch, but the key is finding the right ones to start with. While some forums are full of rants, political discussions, or bickering, you probably are better off appearing to the online world as a reasonable and respectful person, especially if you are interested in job opportunities. 1. Questions—all questions are posted. 2. Responses that emphasize lean principles and actual experiences. 3. Responses which contain relevant practical information. 3. Are redundant, or significantly similar to previous responses. 4. Advocate specific software solutions. 5. Are overly commercial in nature. 6. Are more appropriate for a private dialog (such as 'Hey John, have you tried this....?'). 7. Are derogatory or inflammatory. So if you are looking for answers, connections with people in your industry, and a way to gain visibility, find a network group that matches your interests. For a start, try “Groups” searches on Google, Yahoo, or LinkedIn. Observe the interaction for a while and join the discussion when you find the groups that suit you. Eleanor Randolph in the New York Times calls attention to an example of prototyping a change before investing in permanent large-scale changes. Mayor Bloomberg evidently thought about tourists' tired feet when he closed Times Square to traffic and made a pedestrian area out of it. Then, instead of hiring architects, contractors, and spending millions to lay out seating, trash receptacles, and so on, he had the city buy hundreds of gaudy $10 plastic lawn chairs and parked them on the site. The only things missing are pink flamingos, lawn sprinklers, and wading pools. The neon signs and "video" screens covering the walls of buildings seem to say we're more interested in sensory stimulation than peace and quiet. Tourists and locals have demonstrated their agreement that the idea will improve New York City by filling the chairs constantly and expressing their appreciation for the amenity. People with laptops dot the scene, and at least one business meeting was held in the new park. Now it's clear that there's customer pull for a park in the busiest part of the city. It's still an open question whether vehicle traffic will be worsened more than the benefit of the park is worth, but plans are already going ahead for resurfacing the area and bringing in permanent seating and concrete planters. Not too different from mocking up a new cell with cardboard and surplus stuff before purchasing or moving machines and disrupting production. Experience and observation can determine optimum flow of people (and vehicles now diverted from their usual routes). Just like simulating flow in a full-size cell mockup can allow teams to adjust reality to assumptions. No long meetings, proposals, and computer models can substitute for a simple and quick prototype of a new system. For more on the park, go to "The best seats in Times Square." and take a look at the scene, with more comments, on Flickr.